We carefully picked out 5 of our projects to showcase our skills. From branding and logo design to complex solutions, websites, web and intranet applications. From digital media to hard signs posted on top of buildings, we've done them all, and we've done them right! It's your turn to get the solution to your problem. Evenimente by Niki, formerly known as Nunti Bistrita, is a company that specializes in organizing wedding and baptizing events, corporate parties and more. They have their own restaurants, flower shops and are by far the best event planners in Bistrita. 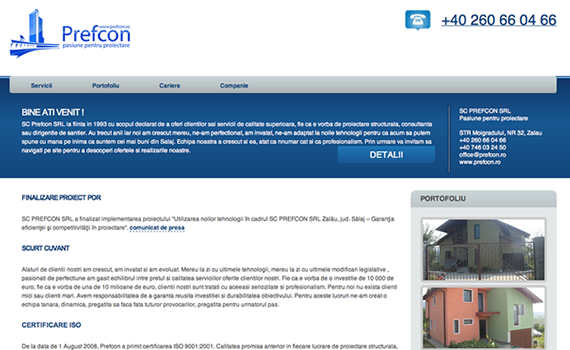 We developed their original logo and website in 2006, then optimized it for search engines. As the client got many clients through the site since then, they asked us to redesign, rebrand, update and upgrade their site to get even more sales. In the screenshots on the left you can view both versions of their site. Prefcon, incorporated in 1993, is a company specialized in structural design, consultancy and construction sites coordination. Their original website was built in 2006, with major redesign in 2008, and minor changes in 2009. The website has a backend administration system. Therefor, the client can update content on their own. In 2008, together with the redesign, the website also got major updates to it's administration system and was optimized for search engine compatibility. WeedboT is a gardening robot that could work well in households, yards or on large cornfields. WeedboT is an ecologic, economic and independent robot which once powered on will look for weeds and tear them out. The robot will know how to differentiate between flowers, wheat, corn, onions, paprika and weeds. With WeedboT one can automatize the maintenance process of yards and lawns, or on a larger scale, entire hectares. WeedboT does not use any toxic materials and substances making it ideal in bio agriculture or in areas around kid play zones. It is a light small robot, easy to maintain that can help farmers cut down on their costs. Our company developed WeedboT's name, brand identity, logo and produced marketing materials its producers used when the robot was showcased in Cluj-Napoca in January 2010. Since then, the robot has been featured in many television journals, newspapers, online media and more. Rebrisoreana is a company that specializes in salami and Romanian traditional sausages production. They needed a website that would put tradition in the spotlight, and they were delighted with the results. The header of the site is nothing else but a Romanian old cottage from the country side. The website's purpose is to provide information to both end customers as well as to potential distributors. Therefor there's information for both these categories of clients structured perfectly so that they don't interfere with each other. Almet is a company that works round the clock near its foundry and presses, producing flanges and other heavy stuff. They needed a name that would incorporate aluminium, metal, and the company owner's last name. Almet was carefully picked out, then we moved to building a concept and their logo. It got soon approved and we moved to providing them with a website, marketing materials, marketing campaigns and management of all of these. The biggest challenge of all was building their sign and put it on top of their building ( which we've never done before), but we got that right too!